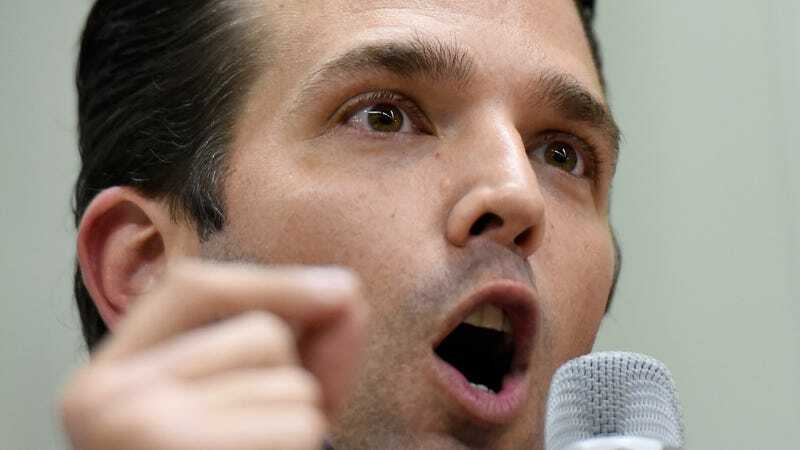 Filed to: Don Jr.Filed to: Don Jr.
It’s been a while since we last checked in with Don Jr., and lucky for us, on Thursday, the Washington Post came out with a profile of Big Daddy Junior Mint that reminds us that he is a sad, sad man who has for years attempted to win the love and affection of his deranged, narcissist of a father while living a life marked by failure and regret. Earlier in his life, Trump Jr. reacted to the chaos that often surrounds his father by bailing out. As a young man, he fled to Colorado, far from his father’s empire. More recently, after his father’s election, he sought to carve out his own identity, separate from the president’s flame-throwing politics. Trump Jr. said he’d be a voice for conservationists. He said he’d be an independent businessman, withdrawn from politics. None of those separations — physical or political — lasted very long. Today, the conservationists still want Trump Jr.’s help, but he has stopped texting them back. The Trump Organization is struggling to hang on to its hotels, but Trump Jr. — one of its top executives — spent much of the fall on the campaign trail, in Texas, Montana, Florida, always on the move. Trump Jr. made his love life into a public performance, just as his father had, even if the audiences were smaller. His father, for instance, once announced his engagement on national TV. Trump Jr. got engaged at a mall in Short Hills, N.J., as part of a publicity stunt for a jewelry store. After he was married, Trump Jr. also had a habit of tweeting out public messages to attractive women. “‘Don, what do you know about politics?’” he recalled his father asking at the start of the 2016 campaign. In his father’s threadbare campaign, that was enough. He told conservation groups — often skeptical of his real estate developer father — that he’d be their ally in the White House, fighting to protect wildlife habitat and hunters’ access to federal lands. On conservation, Trump Jr. did have some impact early on: He helped choose Rep. Ryan Zinke (R-Mont.) as interior secretary. Conservation groups approved, believing the other candidates would give too much leeway to oil and mining interests. But after that, Trump Jr. seemed to cut off contact with environmentalists. “Hey, I need to talk to you,” Whit Fosburgh, head of the Theodore Roosevelt Conservation Partnership, texted to Trump Jr. last year, hoping to ask for his help again. Fosburgh felt that, despite Zinke’s appointment, the Trump administration was still giving oil and mining companies the upper hand. “He wrote back, ‘Sorry, I can’t help you,’ ” Fosburgh said. People around Trump Jr. have speculated about what he will do with the platform he has created for himself. Last year, Trump Jr. seemed to entertain that idea himself: At a speech to a gun club on Long Island, somebody asked whether he’d run for New York governor. “His eyes lit up, he got wide-eyed, got a big smile on his face” and said he’d consider it, said Brad Gerstman, a New York lawyer and lobbyist who was there. “It looked like somebody hit something” that he’d already been thinking about. We’re looking forward to seeing what comes next for Donnie.